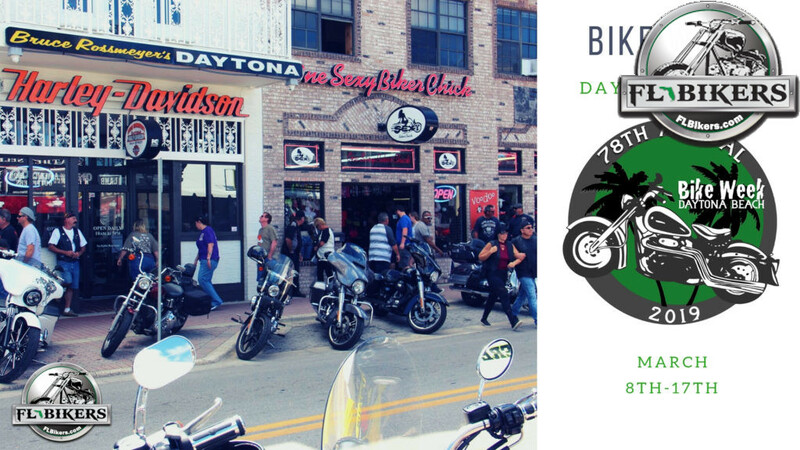 The 78th annual Daytona Beach Bike Week is just around the corner and it’s jam packed with events you don’t want to miss! Make your game plan now to get the most out of your Bike Week! Come join the fun and celebrate 40 years in business!! We’ll have vendors, t-shirts, leather, food, and beer. Don’t miss Cowboy’s special contests every afternoon at Dirty Harry’s! Bobby Friss plays both weekends, while Jasmine Cain and Slaughter make appearances during the week. Come take a free demo ride on the all-new 2019 lineup, featuring the re-designed Indian Chieftain. All riders and passengers must be 18 years or older and wear proper riding attire. All riders must also present a valid motorcycle endorsement. Founded in May 1943, we are one of Florida’s oldest established motorcycle clubs and recognized as Florida’s oldest continually operating motorcycle club. The Daytona 200 Motorcycle Club is a non-profit organization incorporated with the state of Florida. Our headquarters are located at 3602 W. International Speedway Blvd. just outside the western city limits of beautiful Daytona Beach, FL. (That’s just 1/2 mile west of the I-4 overpass on U.S. Hwy. 92…Just minutes away from all the Bike Week and Biketoberfest activities!) We are on the North Side of U.S. Hwy. 92. Turn Right onto Firetower Road and we are on your left. We pride ourselves in being an AMA (American Motorcyclist Association) chartered riding club. Our members are from all walks of life and backgrounds; however, we share two things in common: we like to have a good time and we love motorcycles! Our Club Motto is “We don’t care what you ride, we care that you ride”. Motorcycle Demo Rides, new and used motorcycle sales, various vendors, food, clothing, motorcycle parts and accessories, daily events and pricing specials. Drink specials ALL DAY, ALL WEEK Party with the Kings at Joe’s Crab Shack! Elvis Bike on Display March 13th. Drink Specials! Don’t forget to Get Lucky with Joe’s and wear your green with us St. Patty’s Day on The Roof! Take a joyride with us and experience the thrill of Polaris Slingshot from the cockpit! The Bank & Blues is your one stop shop for music variety while you’re in Daytona. The Razorbacks, have been rockin’ the bank for over two decades, are joined by tons of great acts. We’ve found some outstanding new talent in Flow Tribe, make sure you catch them on the first weekend! The world famous Nighthawks make an appearance on the second weekend of the rally. 9am March 9th-16th inside Bruce Rossmeyer’s Destination Daytona Harley Davidson at 1637 N US Highway 1 Ormond Beach, FL 32174 ! Free shows daily at Bruce Rossmeyer’s Rossmeyer’s Destination Daytona Harley Davidson at 1637 N US Highway 1 Ormond Beach, FL 32174 ! Daytona H-D’s 25th Anniversary Party + Bike Week Kickoff – open to EVERYBODY!!! Live Music + Food + More! Join us for Vintage Motorcycle Racing at the New Smyrna Speedway (3939 SR 44 New Smyrna) on Saturday March 9th from 1-4pm. Get tickets now at Eventbrite. Sons of Speed Showcase Inside The Destination Daytona Pavilion – Come Meet the Racers; see their Bikes & Collections; get Autographs; take pics; etc. 90’s Hair Band, Slaughter hits the stage at Dirty Harry’s Outback for one night only on Wednesday, March 13th. Join us at the Streamline Hotel for an afternoon of classic bikes, food, drink, and fun brought to you by the Antique Motorcycle Club of America. In addition to a variety of vintage bikes, you can find motorcycle-related vendors, alcoholic and non-alcoholic beverage stations, food, a DJ, and more! Halifax Humane Society is proud to present its 2019 Ruff Ride for the Animals on Thursday, March 14th, 2019. Registration begins at 12:00pm at the shelter located at 2364 W. LPGA Blvd. Riders must be checked in by 5:00pm and arrive at The Iron Horse by 8:00pm to be included in the poker tournament. Fabulous prizes will be awarded for the best and worst hands. Proceeds benefit our community’s animals. This event is sponsored in part by Politis & Matovina. The poker run stops have yet to be determined. Visit www.halifaxhumanesociety.org for updated information. Advanced registration tickets (http://www.halifaxhumanesociety.org/Ruff-Ride-Poker-Run-Bike-Week-2018-8-16.html) are $25 per person. On-site registration tickets the day of the event are $30 per person. Donations are strongly encouraged. All tickets will include a limited-edition t-shirt, 1 poker hand, a drink, and a barbecue dinner reception at the Iron Horse Saloon. Think you have what it takes to compete with the best? Show up and crank it to 11. Professional judges will be on-site with competition-grade equipment to see who can claim the title of “Bike Week’s Loudest Bike”. Ever hear 100 V8 motorcycles start up at once? Come feel the ground shake as the world’s largest V8 ride kicks off in our back lot before rolling out to deafen the streets of Daytona Beach. Bikes n’ Bass Bike Show Presented by Bikes On The Beach 5-10pm Inside The Destination Daytona Pavilion. Pre-Register before Thursday, March 14 $25 Bike Show / $40 Sound and Bike Show. The rat is back! The oldest and most prestigious bike show will be in the back lot of Indian Motorcycle Daytona Beach. Free to the public, spectators can view 16 classes of bikes from Rat Rods to full dressers, extreme baggers and antiques! Bikini Coast International Bikini Contest inside the Destination Daytona Pavilion.